The HELIX 7 CHIRP Mega SI GPS G3N is one of the new units released by Humminbird at the beginning of 2019. It essentially offers the same sonar and navigation features as the HELIX 7 CHIRP MSI GPS G3 that we have previously covered here, but does offer extra networking features such as Ethernet and NMEA 2000 compatibility. For reference, this is the Humminbird part number 411080-1. It’s also referred to as Humminbird HELIX 7 CHIRP MSI GPS G3N. 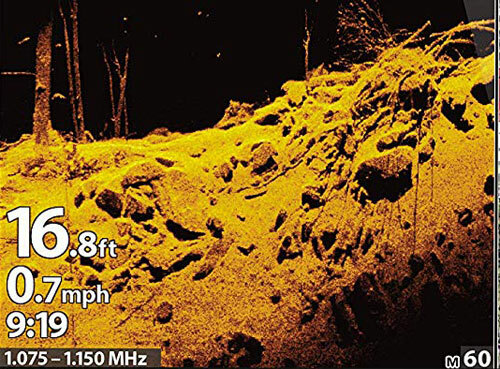 There are three main types of sonar available with this Humminbird fish finder. These are Dual Spectrum CHIRP (2D), Down Imaging, and Side Imaging. As the title suggests, the unit also offers the Mega SI and Mega DI modes. Evidently, since the unit supports Ethernet, it also supports 360 Imaging sonar. Plus, its main supported sonar frequencies are 50/83/200/455 kHz, so you can pair it with a 50 kHz CHIRP transducer in case you need to scan greater depths than 3,000 ft. The unit’s Dual Spectrum CHIRP sonar makes available three modes. These are Full Mode (150-220 kHz), Wide Mode (140-200 kHz), and Narrow Mode (180-240 kHz). The Full Mode is adjustable. It gives you the possibility to select a desired CHIRP interval within the maximum possible frequency range. The 150-220 kHz is its default setting. The Wide and Narrow modes are fixed, though, for the aforementioned values. When it comes to Side Imaging, the unit offers two modes; these are regular Side Imaging at 455 kHz (440-500 kHz) or Mega Side Imaging at (1075-1150 kHz). For Down Imaging, the unit uses the same frequencies, 455 kHz (440-500 kHz) for regular Down Imaging, and (1075-1150 kHz) for Mega Down Imaging. The HELIX 7 CHIRP MSI GPS G3N includes the new XNT 9 HW MSI 150 T transducer. This is a High CHIRP transducer which also supports the Mega SI and Mega DI modes of the unit. It’s made of durable ABS material, has 20′ (6 m) of cable, and also integrates a temperature probe. For Side Imaging, the transducer uses two thin side beams, their angles being approx. 86°. Each beam can extend up to 240′ (73 m) on its side of the boat, the total side-to-side coverage of the regular SI being 480′ (146 m). For Mega Si, the coverage is only 125′ (38 m) on each side, and 250′ (76 m) total. For Down Imaging, the transducer also uses thin beams, but they scan directly under the boat, not on the sides. Their coverage is 75° for both regular DI and Mega DI. Just as for Side Imaging, the DI beams can reach depths up to 125 ft (38 m) when using regular DI, and 75 ft (22 m) when using Mega DI. For Dual Spectrum CHIRP, the transducer uses conical beams. Their coverage is 42° when using Wide Mode or Full Mode, and 25° when using the Narrow Mode. 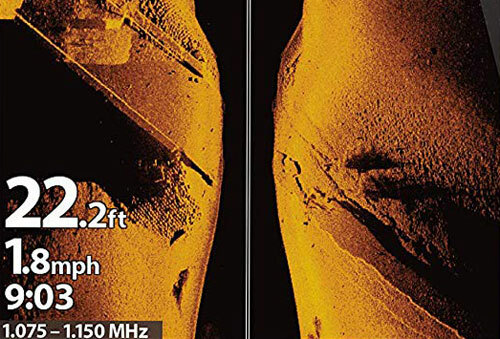 The maximum depth capability of the 2D sonar with this transducer is 1,200 ft (365 m). Needless to say, the unit offers the full range of standard sonar features. It has the SwitchFire function, the Selective Fish ID function, Real Time Sonar, Bottom Lock, Split Zoom, Sonar Recording, Depth Alarm, Fish Alarm, and more. The Humminbird HELIX 7 CHIRP Mega SI GPS G3N has an internal GPS antenna which can provide fast position fixes accurate within 2.5 meters. It can also provide position enhancements via WAAS, EGNOS, or MSAS. It shows the latitude and longitude of any waypoint or point of interest. There is also a GPS speed function which basically allows the unit to calculate the speed of your boat based on the GPS data. The unit offers better waypoint management than the previous units as it comes with an improved icon database including species-specific symbols such as walleye, pike, bluegill, or bass, so you can quickly identify them at a glance. It offers the possibility to store up to 2,750 waypoints in its memory. Route creation and trackplotting functions are also available. The unit can save up to 45 routes and 50 plotted tracks with up to 20,000 plots per track. Each track can be converted to a route, you can add waypoints to it, and re-trace it if needed. 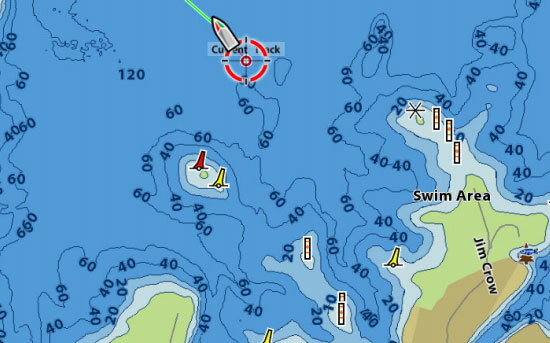 The unit’s internal chart platform is the Humminbird Basemap. These charts offer both in-land and coastal coverage. For the inland waters, they cover more than 10,000 U.S. lakes with 1′ contours and numerous points of interest. They also provide coverage for the entire U.S. East Coast and West Coast, showing markers, buoys, marinas, hazards, nav-aids and more. However, the unit is also compatible with Navionics+, Navionics Platinum+, LakeMaster, LakeMaster Plus, and SmartStrike fishing charts. AutoChart Live is also an available feature with this unit. This application uses the 2D sonar and the GPS data in order to draw the depth contours of your lake on the map. Therefore, if the charts that you use don’t offer satisfying detail for your lake, you can always map it via AC Live. The unit can store up to 8 hours of recording, but you can always opt for a Zero Lines microSD card in order to considerably expand the recording possibilities and to benefit from a specifically designed platform for the AC Live feature. As we’ve mentioned above, the unit supports Ethernet and NMEA 2000 networks. Therefore, it also supports CHIRP Radar and i-Pilot Link. It can also provide data from AIS units and supports external GPS heading sensors. The HELIX 7 CHIRP Mega SI GPS G3N features a 7-inch display, with a pixel resolution of 800 x 480. It has LED backlight and provides excellent readability even in direct sunlight. It’s also IPX7 waterproof. The unit’s interface is keypad operated. It does not have cross-touch technology. It has integrated Bluetooth technology, which allows you to sync it with your smartphone via the FishSmart App, in order to get notifications and use other features. It’s also compatible with the RC2 Bluetooth remote control which allows you to control most of the fish finding and navigation features without touching the unit. Along with the Ethernet and NMEA 2000 compatibility, the unit also has a microSD card slot. This being said, you can opt for an extra microSD card with Navionics or LakeMaster charts. However, you can also use a microSD card for data transfer, software updates, or sonar recording. Last but not least, the unit includes the standard Gimbal mount. The in-dash mounting kit is not included. Also, the box does not include a unit cover. 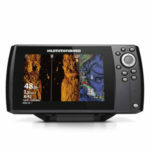 The Humminbird HELIX 7 CHIRP Mega SI GPS G3N is a fish finder and chartplotter offering Dual Spectrum CHIRP, Mega SI, Mega DI, GPS, Humminbird Basemaps, Ethernet support, Bluetooth and many other features. It includes the XNT 9 HW MSI 150 T transducer which supports all its sonar applications (except 360 Imaging). It’s a versatile unit, great for a wide array of boats, offering an excellent value for the price.